Located in the heart of Cambodia's capital city Phnom Penh by reputable local developer Oxley. Many Singaporeans are purchasing properties in countries such as UK, Australia, Malaysia, Philippines, Thailand, etc in view of the ABSD, SSD Laws in Singapore. Are you thinking of jumping on the bandwagon and purchase an overseas property as a hedge against inflation but hesitating as you're unsure of the pitfalls of purchasing foreign property? Look no further as we present to you The Bridge in Cambodia's capital city by reputable local developer Oxley Holdings. Oxley is a Singapore mainboard listed company and has spent a sizable amount on researching the viability of investing in Cambodia and also offers a guarantee of rental yield of 6% annually as an added assurance to potential buyers with the option of 7% annual yields should the tenant renew leases after 3 years. RARE FREEHOLD INVESTMENT WITH HIGH 6% PER ANNUM RENTAL GUARANTEE, FROM ONLY US $100K. LOW CAPITAL OUTLAY. DEFERRED PAYMENT! SUPER PRIME LOCATION ! SMS CHRIS CHOW 98348607 FOR MORE INFO! DON’T MISS ON THIS RARE OPPORTUNITY! Situated just 2 minutes away from Preah Sihanouk Boulevard, right in the heart of Cambodia’s capital Phnom Penh, The Bridge at Cambodia offers discerning individuals units for shops, homes and SOHO (small office home office). The Bridge at Cambodia up to 45 storeys high, comprises of commercial and residential spaces. Five levels of retail space inclusive of 2-storey shophouses available for shopping, entertaining and dining. Stellar apartments, consisting of 1, 2+study and 3 bedrooms units, as well as penthouses. SOHO (Small Office Home Office) units offer a combination of live, work & play. foreign investors in the different business sectors. 2,352 units, comprising 762 residential apartments and penthouses. Modern facilities including swimming pool, gymnasium, playground, function hall and round-the-clock security. Twin Tower Commercial Building 154 meters tall. Near embassies such as Australian Embassy, Russian Embassy, International Schools, High Schools, Theatre, Convention & Exhibition Centre, Parks, Elite Golf Club, Hotels, Markets, Cultural Centre. 2 minutes from Preah Sihanouk Boulevard and 5 minutes from Diamond Island. 360° view of Bassac River, Diamond Island and Phnom Penh city. 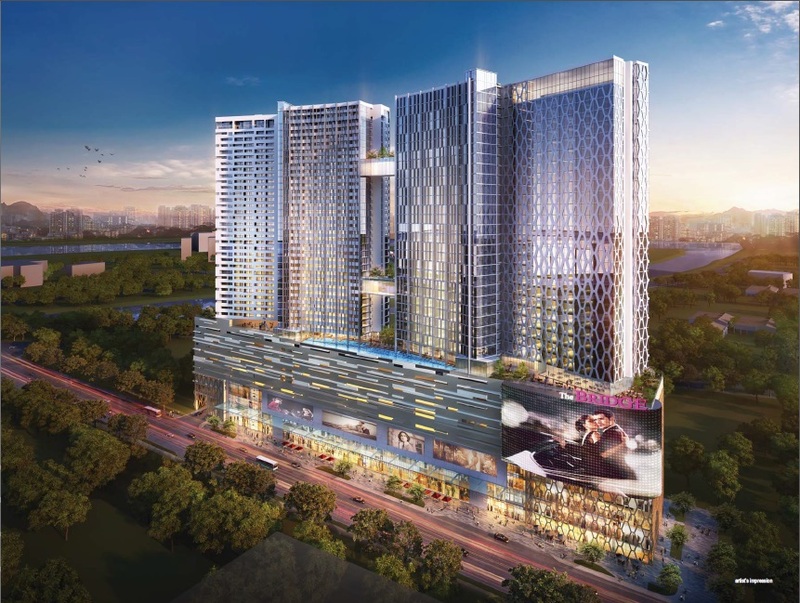 The Bridge, freehold, mixed residential and commercial development, is a joint-venture of two prominent property developers – Singapore Oxley International Pte Ltd and Cambodia Worldbridge Land (Cambodia) Co., Ltd. Located in the ultra-prestigious NagaWorld area, a stone’s throw from the NagaWorld Hotel & Casino, a leading world-class casino-hotel. Ø 4. Balance 50% payable upon handover of unit. Financing available by Maybank Singapore.